Social scientific approaches to studying any given phenomenon are customarily divided into two groups. ‘Emic’, or interpretative approaches, focus on how people experience and make sense of the phenomenon in their own terms, whereas ‘etic’ approaches seek to provide explanations that are external to actors’ interpretations. 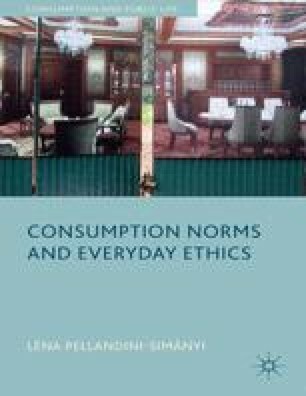 The present chapter follows an emic approach, focusing on what consumption norms mean to people and what is the internal logic guiding them. Etic approaches, inquiring into how to explain consumption norms, in turn, will be discussed in the next chapter.